As we show examples of the latest church building trends, one in particular is well-suited to pictures rather than words: Third place church design. In this post, we’ll make the concept clearer by sharing some photos of one church that has been embracing third place church design for a couple of decades. The name may sound funny, and if you missed our earlier post on this topic, here’s a brief recap on the concept of third place design. The idea is that most of us have two places we go in our lives: home and work (or school). Third place design seeks to create another place beyond those two where we can gather, a town square-like concept, where social and personal needs can be fulfilled. The idea behind third place church design is for churches to become a community gathering space. 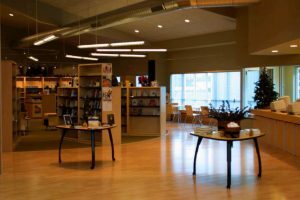 By offering amenities like full-service cafes, bookstores, play spaces, recreational and community buildings, even doctors offices, churches can insert themselves into everyday culture. One of the earliest adopters of third place design was Vineyard Christian Fellowship in Columbus, Ohio. 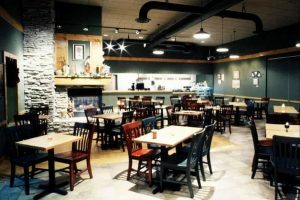 Way back in the 1990s, they installed one of the first church cafés, which you can see pictured here. This full-service café was revolutionary for its time. It was always intended for more than coffee and conversation after church on Sunday. People could order soups and sandwiches as well as beverages. There was live music on weeknights. It was a community gathering space. Today, Vineyard has grown and expanded the concept of third place church design quite a bit. 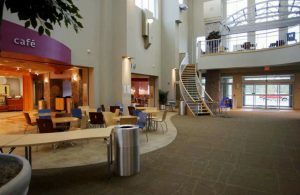 Pictured is a newer, brighter café adjacent to their spacious foyer. Next to the café—and you can see it in more detail in this photo—they have installed a bookstore that provides another reason for people to drop by during the week or stop in for a gift on the way to a party. 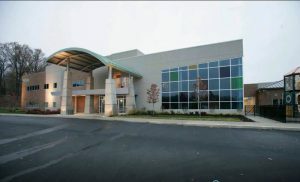 Vineyard has also more recently expanded and built an entire new church building embodying this hot church design trend. They call it the Vineyard Community Center and it’s got all sorts of activities to attract members of the community: indoor and outdoor play lands, daycare, and a variety of classes. 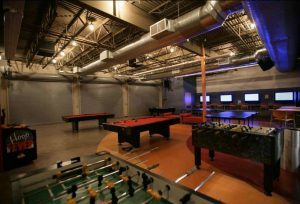 There is this spacious game room that’s also used for youth ministry. Those garage doors lead out to a large gym where they do intramural athletics of all kinds. But the focus isn’t just on children. Vineyard is a large church with many members who are doctors, dentists and nurses. 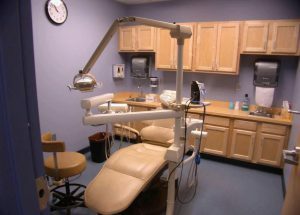 They’ve taken advantage of that gift and created exam rooms where medical members volunteer their time, giving free exams. Are You Ready to Make this Major Investment? It’s important to mention that church building trends like third place design can be expensive. These dedicated spaces, and the staff to run them—even if some are church volunteers—requires a big financial commitment from your church community. But if your vision includes making your church part of everyday culture, third place church design is a great way to do so. For more information on church building trends and other helpful information on church design projects, sign up today for our i3 webinars.